Keepsake ornaments are my favorite thing to make with my kids. 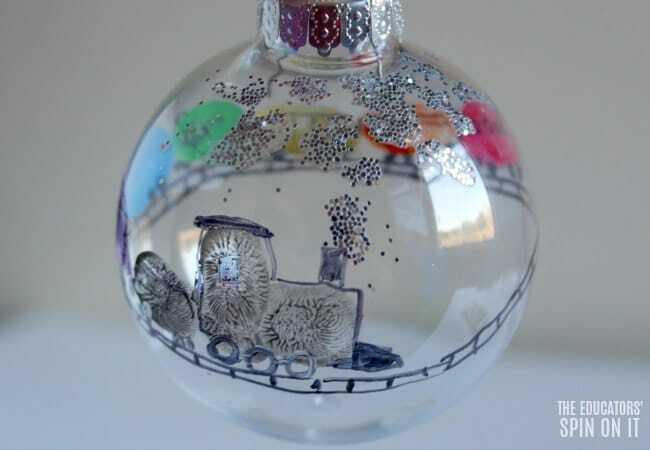 This fingerprint train ornament is so adorable and inspired by one of our favorite train book Freight Train by Donald Crews. 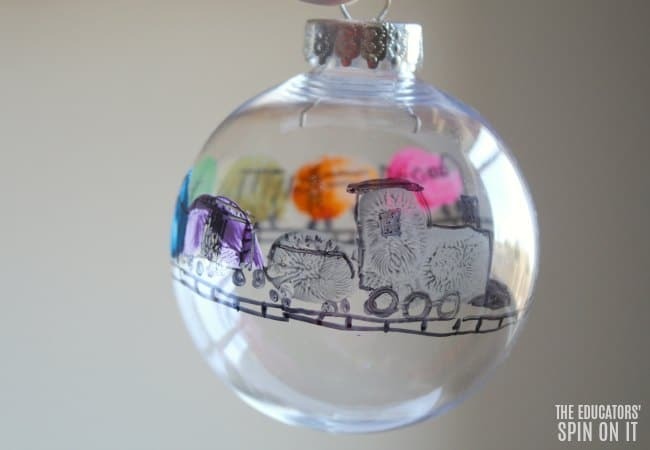 If your child loves TRAINS, come see how much fun this train ornament is to make! 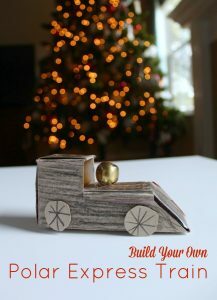 This train ornament craft was inspired by our featured book at The Virtual Book Club for Kids calledFreight Train by Donald Crews. In the story the author uses simple but powerful words with colorful illustrations to capture our childhood memories of trains rolling by. It’s a Caldecott Honor Book that featured bright colors and bold shapes which inspired this colorful fingerprint Train Craft. 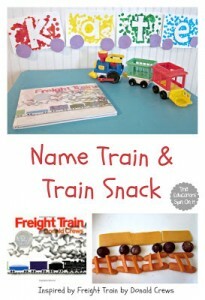 Click here to see some more of my favorite train books! 1. Set up an area with your paint to dip their fingers into to paint the train. I set mine up by putting the colors onto a large paper plate. I put a small dot of paint to represent the colors of the rainbow from the book Freight Train. So grab red, orange, yellow, green, blue, purple and black paint! TIP: I also set baby wipes at the table for easy clean up. 2. 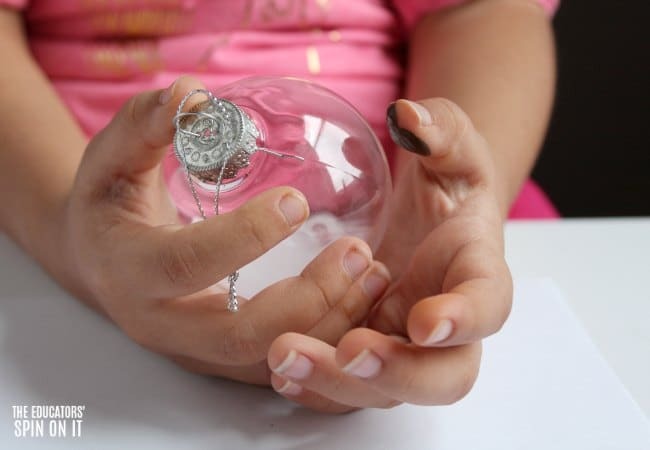 Have your child carefully dip their finger into the pain and then lightly press onto the clear ornament. 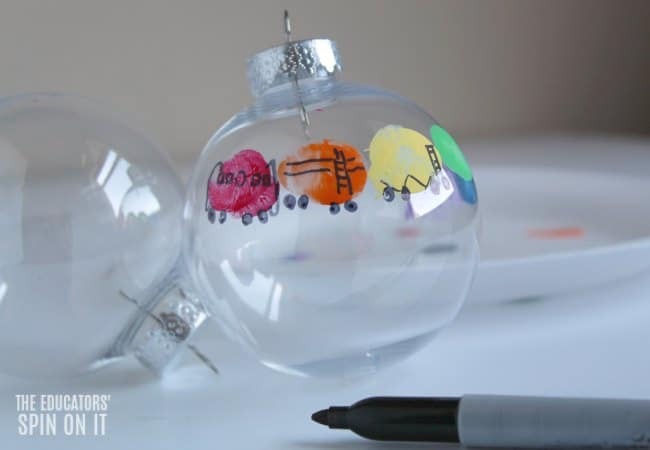 Depending on the size and age of your child you may need to use to prints together to make a train car visible on the Christmas Ornament. 3. Continue to use a finger print for each of the colors to complete the train. For the Engine of the train use 2 fingerprints, one that goes verticle and one print that goes horizontal. Allow to dry. 4. 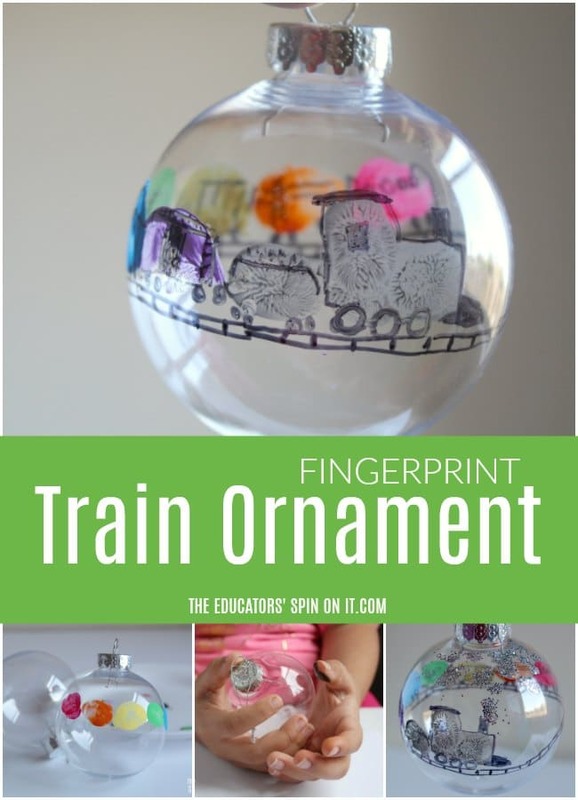 Once the finger prints are dry you can add the train details to the ornament with a black permanent marker. Start with the wheels and then the details of each type of train car. 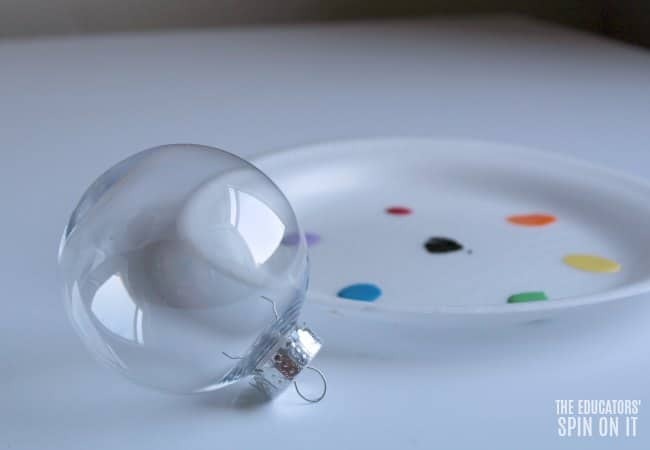 Depending on the age of you child they may need to have you do it with them or you might be able to give them the market to draw certain elements to make the fingerprints look like train cars. 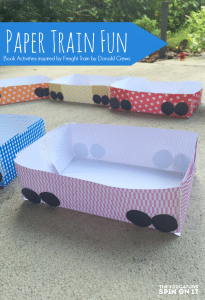 TIP: You can create a copy of what you’re making on a sheet on paper so that you child can get an idea of the concept of how to transform fingerprints into train cars. 5. Then add the train tracks below the wheels to go all around your Christmas Train Ornament. The best part is when you spin it, it will begin to look just like the end of the book… Going Going, Gone! 6. Add with glue the smoke coming form the train engine and then sprinkle glitter onto the glue for a little Christmas glitter shine with the Christmas lights. 7. You can personalize the ornament by adding a name or date of birth with the permanent marker . 8. 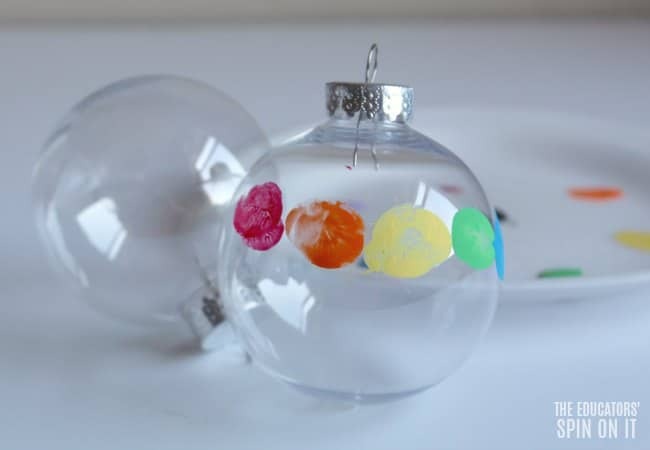 Allow to dry and then share this handmade ornament with someone special to hang on their christmas tree. Be sure to visit my other Train Week Cohosts at the Virtual Book Club for Kids to see what train themed activities they are sharing with you! They are featured here below. 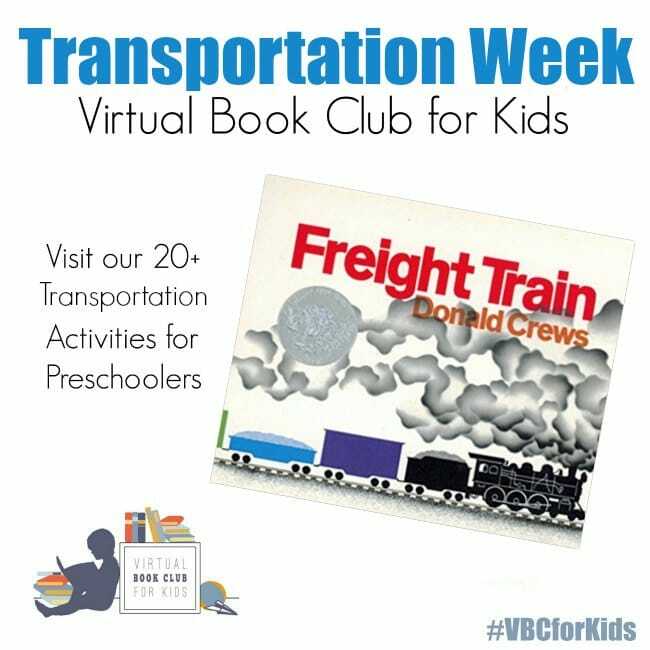 Come share what your’e up to during TRAIN WEEK in our Weekly Virtual Book Club for Kids Facebook Group! Share your photos on instagram with the hashtag #vbcforkids too! Join us next time as we featured the book Merry Christmas Mouse and featured Ornament Week at our Virtual Book Club for Kids!